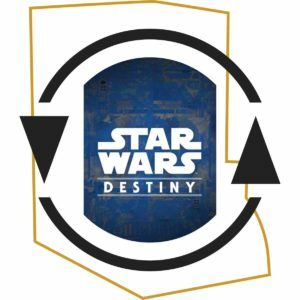 As a huge fan of Darth Vader, I immediately headed to SWDestinyDB.com and started building decks. The first two are below. Both feature the new Vader and a First Order Stormtrooper, but one is a control variant and the other is more of an aggro deck. Being able to build two very different decks with the same characters is an upside of such a large card pool at this point. The goal of this deck is to make it as difficult as possible for your opponent to kill Vader. Between Dug In, Force Illusion, Witch Magick, Unyielding, and Rise Again, your opponent should have an immensely difficult time with Vader. A notable trick is using Become One on a 3 or 4 melee side of Vader’s to resolve resources. This can help you ramp into upgrades or play cards like Rise Again when your opponent is not expecting it. Once you have a few upgrades on Vader, don’t be afraid to nuke your Stormtrooper with The Price of Failure. This will enable your Indomitable if you haven’t already seen the card. It should also mean you are first to claim the battlefield, enabling Dug In as well. Another finishing move is Unyielding, which can let you get past shields or Force Illusion. If you can stomach the risk, I also love the swagger of playing Overconfidence to re-roll a Vader die and an opponent’s die! Where the control deck aimed to have Vader on the board as long as possible, this one wants to get ahead on the damage curve and never let up! The goal is to get a few upgrades on Vader and hit the Boundless Ambition + The Price of Failure combo. The key to winning with this deck is going to be timing The Price of Failure. A lot of times Price of Failure decks feel like you’re playing it too early, but the moment you can reasonably kill an important enemy character it is usually worth going for the kill. I was so excited to get the new Vader on the table, that we even proxied and played games with him yesterday! You can watch those games below and in one of them, I actually play Price of Failure on the very first turn! I play against Obi-Maz, Mother Talzin Commandos, and Solo Sabine, giving a good idea of how Vader might pair against a variety of decks. From what we are hearing from distributors, the release date for Across the Galaxy is now set for November 8th. This means the window to sign up for a booster box subscription to get the best price and free shipping on Across the Galaxy booster boxes will be closing soon. We also have a very limited number of Across the Galaxy Saga Sets remaining, if you wanted to skip the randomness of booster boxes and guarantee you get Vader! 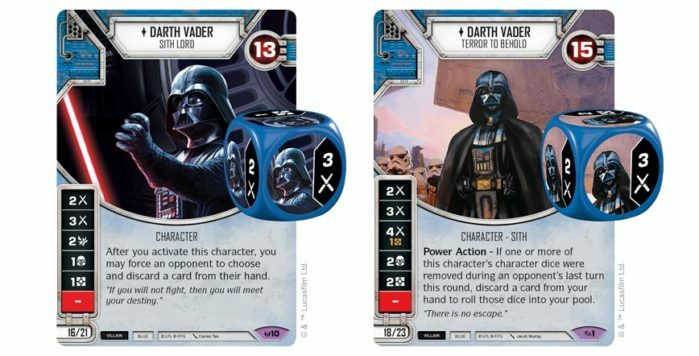 As exciting as the new version of Darth Vader is, I am even more excited about what this means for the future of Star Wars: Destiny. In an old interview with the original Destiny lead-designer, Lukas Litzsinger, he mentioned the first two sets were designed before the game was released. Since it takes months to print sets of any game, this was not surprising. If the second set was going to release anywhere near the first, it had to all but be at the printers by the time Awakenings released. This also meant that the third set, Empire at War, was the first set designed after the game released. I once heard another designer say there were more games played on the day of release than in all of play-testing. With thousands of players playing, it turns out you learn quite a bit about the game after release. Over the past twenty years, I have played every Star Wars tabletop game I could get my hands on. One thing I have noticed is how many of them make the first version of Vader a complete monster. Unfortunately, it is also very common for him to be over-costed. Awakenings Darth Vader was no exception. He had the highest health in the game and his damage output was only matched by Luke Skywalker. He was so good, in fact, that he was featured in the deck that won the first World Championship. 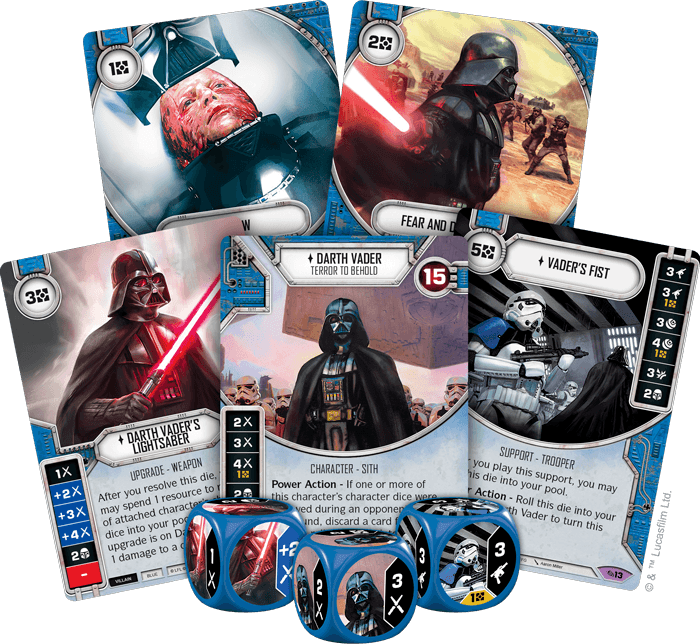 At the time, I remember wondering if maybe FFG had pulled off a miracle and appropriately costed Vader… Two or three sets later though, it became apparent that even they had fallen prey to over-costing. Unfortunately, most of the early characters also feel over-costed. They either don’t have a good character pairing or aren’t bringing enough to the game to be playable. In turn, this makes other characters seem under-costed. Characters like Maz Kanata (Spirit of Rebellion), Yoda (Legacies), and Kylo 2 (2-Player Starter) keep a lot of the other characters off the table. In retrospect, it seems like there was a general lack of understanding in regards to the cost of cards in Destiny. This extended to the events, supports, and upgrades in those early sets as well. A quick comparison of Feel Your Anger and Undermine makes this painfully obvious, with Undermine representing a reigned-in, balanced version of Feel Your Anger. While the early cards are all either unplayable or so good they make the rest of your cards irrelevant, there is a silver-lining. As the Legacies cycle comes to a close with Across the Galaxy, cards like the new Darth Vader give me confidence that the designers have learned critical lessons from past failures and are actively applying them to their future card designs. This can be seen in the design of the newest Vader compared to the Awakenings Vader. Investing 21 points for Elite Awakenings Vader was significant. If your opponent could control one or two of his dice on the first few turns, he didn’t create enough of an advantage on the rest of the turns to ever put you back in the game. A single Easy Pickings on the first or second turn removing both Vader dice was enough to lose you a game. The new Vader doubles down on fixing this issue. The first (and most obvious) fix is his power action. 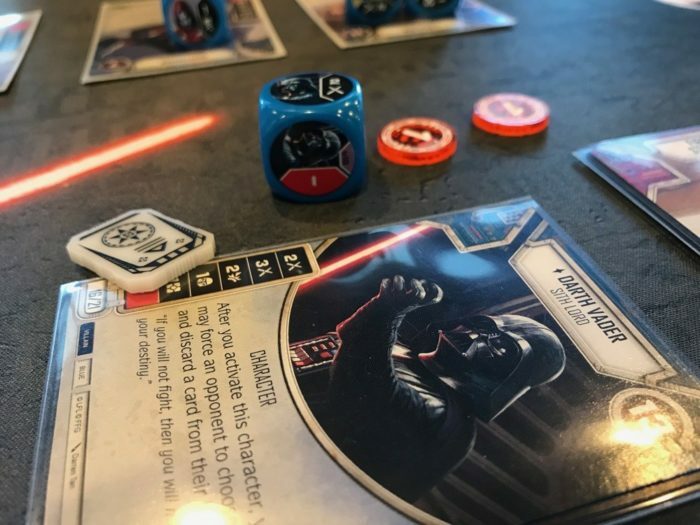 Being able to take an action and roll all removed dice back into the pool means your opponent is going to have to spend multiple cards and resources if they want to control Vader. He doesn’t completely prevent your opponent from controlling him though, since back to back turns with control cards can remove his dice. The second way they addressed the core issue with the original Vader is by giving him a third damage side. Awakenings Vader only had a one in nine chance of rolling two damage sides, while the new Vader has a one in four chance. As bad as Easy Pickings was, it could go even worse if you only roll one damage at a time and your opponent can play 0-cost cards like He Doesn’t Like You or Hidden Motive to mitigate his dice. While the new Vader loses his ability to discard an opponent’s card each round, he gains a critical 2-resource side. 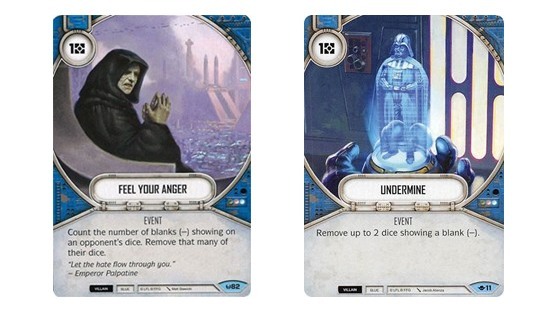 While it is easy to get wrapped up in the hype of this insane new Vader or the release of a new set, I am even more excited for set 7 to arrive and for the first three sets to rotate out of standard play. The card design in the Legacies cycle is much stronger than the first cycle, so I believe the improvement in gameplay after rotation is going to be significant. What do you think? Are you looking forward to rotation? Are you excited about the new Vader? What would you change about my decks?